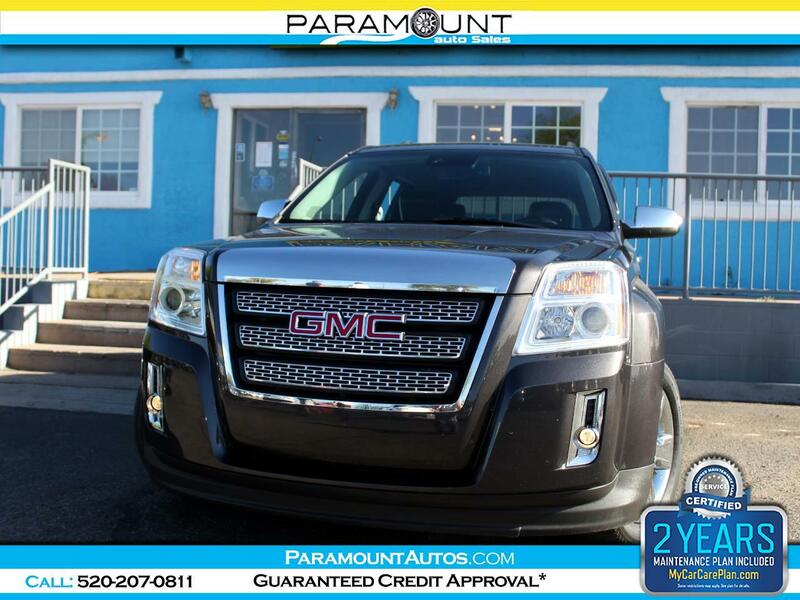 2015 GMC TERRAIN SLT1 1-OWNER CARFAX CERTIFIED SUV!! THIS THING IS NICE! IT HAS TONS OF FEATURES AND OTPIONS, ALMOST EVERY ELECTRONIC GOODIE INCLUDING BLUETOOTH, BACK UP CAM, NAVIGATION, TOUCHSCREEN INFOTAINMENT SYSTEM WITH DIFFERENT APPS, COLLISON AND LANE DEPARTURE WARNING SYSTEMS, AND MUCH MUCH MORE!! WE ARE PRICING THIS ACADIA THOUSANDS OF $$ BELOW BOOK VALUE TO SELL FAST!! IT COMES WITH A WARRANTY, CARFAX, AND 2 YEARS OF MAINTENANCE... EASY FINANCING AVAILABLE!! **GUARANTEED CREDIT APPROVAL!! ** CALL FOR DETAILS .. Visit Paramount Auto Sales online at www.paramountautos.com to see more pictures of this vehicle or call us at 520-207-0811 today to schedule your test drive. Information deemed reliable, but not guaranteed. Interested parties should confirm all data before relying on it to make a purchase decision. All prices and specifications are subject to change without notice. Prices may not include additional fees such as government fees and taxes, title and registration fees, finance charges, dealer document preparation fees, processing fees, and emission testing and compliance charges. Advertised prices are guaranteed to cash buyers only. Internet special price may not be compatible with dealer sponsored or subsidized subprime financing. Military discount is not stackable with TrueCar and its Affinity Program discounts.